Popularly known as Mudlo Gap, Mudlo National Park is a vine forest located on the Sunshine Coast in Queensland. The 22-sq.km park provides excellent views and enjoyable walking trails for sightseeing enthusiasts. The park is one of the few areas in the world protecting native pine rainforests, the tall pine trees that once covered much of the surrounding coastal ranges. There are a number of amazing things to do at Mudlo National Park. Take a short 10-minute scenic drive from Kilkivan to the park, where you will be met with stunning views of the steep slopes of the park. 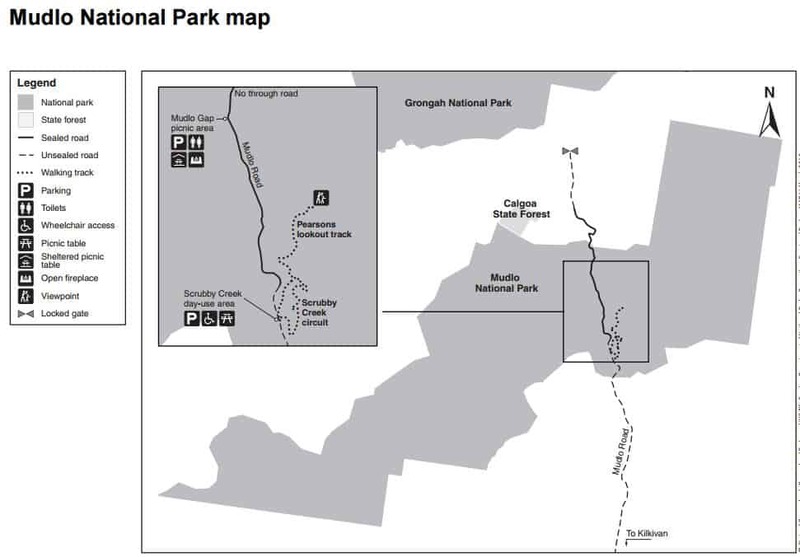 There are two main walking tracks in the park: Pearsons Lookout Track and the Scrubby Creek Circuit. Pearsons has a distance of 3kms (return) and takes around 1.5-2 hours to complete. The track is steep and has steps, and is suitable for those with moderate fitness levels. The view at the top is worth the climb. Scrubby Creek is a short, 1km circuit that only takes 30 minutes to complete. This walk allows you to explore the vineforest and is suitable for all fitness levels. After your walk on the Scrubby Creek, stop here for a picnic. You will find a wheelchair/stroller accessible picnic area with picnic tables. Alternatively, travel on to Mudlo Gap for beautiful views of the forests as well as picnic tables, shelter, toilets and BBQ facilities. Please note that dogs are not permitted with the Mudlo National Park. Camping is not allowed in this park but it is possible at Kilkivan. There are bush camping facilities located here as well as a caravan park. For others who prefer more comfortable accommodation, there are hotels and B&B in the areas surrounding the Mudlo National Park. Click on the link below to find the best accommodation deals. For your safety, walk in daylight hours only.